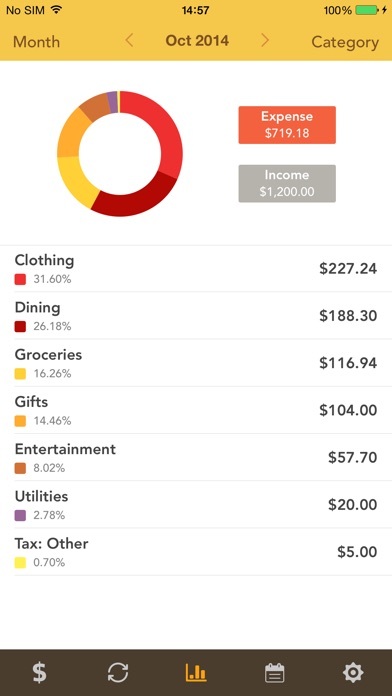 An easy & quick way to manage your daily finances, Checkbook Pro keeps track of your credit card charges, cash expenditures...etc. With Checkbook Pro application, it can totally replace your paper checkbook. You can create multiple accounts, save recurring transactions, transfer funds, view reports & graphs, export data...etc. You can even search the transaction by crossing your finger on the calendar! All details of the Checkbook Pro are well designed to provide excellent experience. FEATURES ※Export in CSV, QIF & HTML Formats -Export your transactions by email for use of desktop applications such as Excel, Quicken...etc. 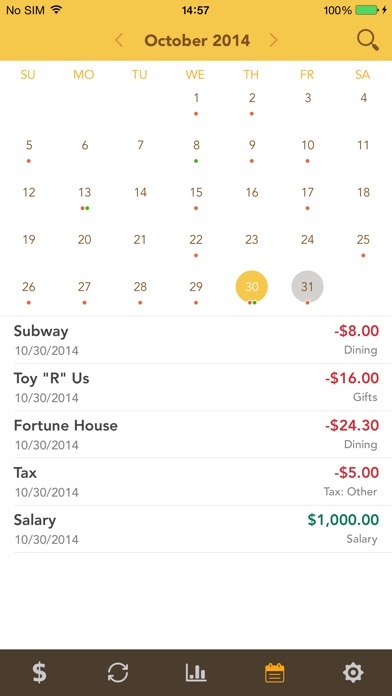 ※Calendar -Show all your monthly transactions as points on the calendar. -Filter transactions by tapping a date or selecting multiple dates on the calendar. ※Recurring Transactions -Save a transaction to be used repeatedly(daily, weekly, 2 weeks, monthly, tire monthly), without retyping all the details. ※Multiple Accounts -Track as many accounts as you need. ※Categories -Supports multiple categories with beautiful icons to choose from. 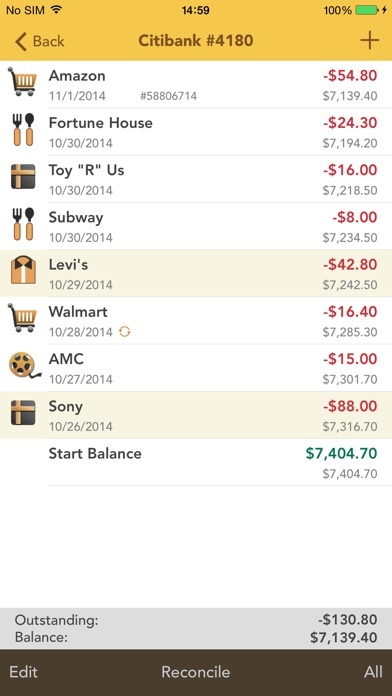 ※Payee & Note -All details you need to keep track of your transactions are including. ※Search -Quickly search for transactions by dates, name, payee and category. -Search and edit transactions in the same screen. ※Transfer -Transfer funds from one account to another. ※Reconcile Transactions -Reconcile your transactions by editing cleared/un-cleared status ※Reports & Charts -Review all your expense & income by category or account with beautiful graphs and reports. -Supports both bar and pie charts. -You can set the time period to daily, weekly, monthly & yearly. ※Passcode -Protects your private information. ※Currency -Supports multiple currencies. ※Elegant, Powerful & User friendly interface If your have any problems or suggestions please send a mail to checkbook@appxy.com, you will get the response in a short time. Super bummed. I can’t even get it to login today after it glitched last night and lost ALLLLL my account stuff. I’ve had this app for years but it’s never worked right and now I have to start from scratch. I bought this application about five years ago. I upgraded to the pro version, and last year a new version came out that completely re-done the user interface. 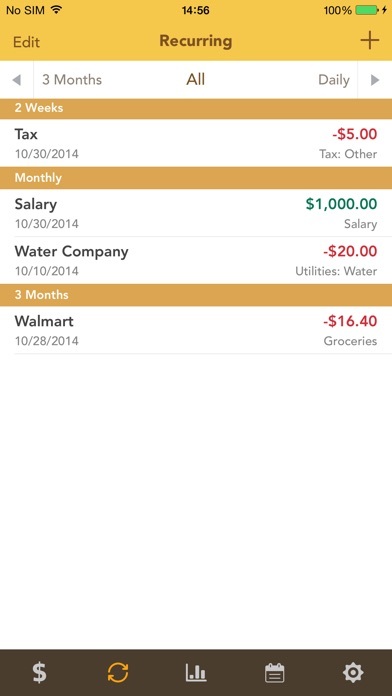 It added the ability to sync the checkbook between multiple iPhones or iPads. It said that I would not be charged again, however I was. But this application has been such a lifesaver that I did not mind paying the $4.99 again (and five bucks is not worth hassling the developer or iTunes about....unless the app sucked or was rarely used). Now, since the new update, I am a lifetime member because of my loyalty. It is well worth scrapping your paper checkbook register and using this. You will not regret it. You will be able to keep all of your accounts up to date and to the penny. My only complaint is that I have written to the email given in the description and in the application three different times. A couple of times was a couple of years ago regarding questions about problems that I had, which I later solved on my own. Then I emailed about two weeks ago and asked a question and made a request. I have yet to hear back from that one either. Maybe my emails are going to their spam folder and they are just not getting them. I like to give people the benefit of the doubt. Either way, you really don’t need Customer Service now, because the app takes care of everything. This used to be a great checkbook app. Now it is no longer supported. I opened it up last week and received an error message that my email or password has changed. This wiped out all my checkbook data on my iPhone. Tried to sign in to recover the data but the password that should have worked did not. Filled out the forgot password reset. It said they sent an email but I never received one,even after multiple tries on multiple days. There is a link to a website on the Appstore page but it has no way to contact anyone for support. After using this app with absolutely no complaints for at least 5 or 6 years, I opened it yesterday and ALL data was gone. This is very disappointing as I have relied on this app to manage my personal (instead of household) account. Now I have no record of it at all. I like this app very much. The first of March i lost every thing and had to start over. I wish there was a back for it. After entering my code to unlock the app, I got a noticed that my email had been changed. Problem was, I didn’t change it. Reached out to customer service who asked a couple of questions and then went silent. Completely ignoring me now. Used the app for five years and can no longer access my information. SO DISAPPOINTED in how I have been treated. So many records... GONE. What gives?! So disappointed with this register. It worked perfect and then they came out with new update and it is awful. It keeps adding the same check amounts over and screws up my balances. Going to find something else. I used this app for several years without issue. When I opened it today, everything was gone. Years of information gone. Whenever I tried to set up an account it told me my email was already registered. When I tapped reset password and entered it, I received a message saying there was no account for that email. DON’T USE THIS APP. Where did all my data go??? Been using this app for years and all of the sudden today I open it and it says I need to login and all my data from years is gone. Plus I am unable to log in. Please Help. Cannot export. Says need email even though I have email. Worked great until I got a tip that says your email or password has been changed, please re-log in. I lost all my account information on all of my devices. Never changed email or password and it didn’t recognize my email and password. In fact it even allowed me to create a new account using the same email and password as before. I like this checkbook register app with one exception...I upgraded to the Pro version @ $9.95 on February 9 and today during my iPad apps upgrade the Pro version went away I had to spend another $11.00 to get it back. Am I going to have to spend $11.00 every month just to keep my checkbook transactions? Good app but not worth $11.00 per month subscription. This has been a great app, but I can’t get it to delete a category I put in wrong...can you fix this? I fixed my last problem but is there a way to void a check, other than delete the check? I’d like to keep records of voided checks also. Please let me know! I’ve long looked for an electronic check register for multiple accounts showing debits, credits and maintains a running balance intuitively and obviously placed. This app functions brilliantly. Thank you! I had to switch to using my iPad for my checking register. This one is sufficient to my needs, but I don’t love it. I wish there were a help feature. Also, at the end of the year, I really have to have a hard copy of some reports for tax purposes, and if there is a function to allow printing a copy, I can’t find it. I can’t really recommend this, but the one thing that it has going for it is that it is not complicated, and I don’t get distracted by too many graphics and colors. Does everything I want in a check app. I’ve used this app for years and loved everything about it. 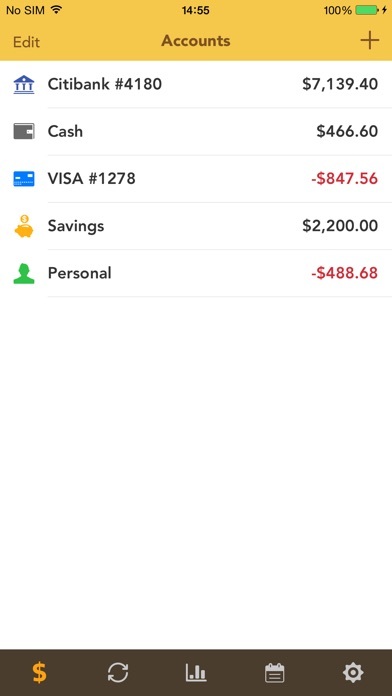 I enter transactions every day and have always made sure I balance with my bank EVERY DAY. Then 2 days later, the app balance no longer is the same as my bank. This has been going on for about 3 months or so. I’m forced now to find a different app because this is driving me crazy! The app works great if you not logged on to sync with another device, but if you log in, it doesn’t work at all. I wished the app would sync across both my iPad and iPhone. I've used this app for five years. Have also downloaded and tested several others during this time. Easy to use, in fact one of the best I have found for a check book ledger. Paid version allows setting up multiple accounts to use in multiple ways (an acct to store passwords, another to log cards and membership numbers...). I would rate a FIVE, if it also offered: 1) ability to sort any column (by payee, date, amount). Just to alphabetized would be a GREAT benefit, especially for extra accounts mentioned above. Currently, to alphabetized a "special" account, I assign Dates to each entry. So, since the app sorts only by dates most - recent first, any item beginning with "A" through "G" are dated in 2007 (assigned specific months, then days to keep them alphabetized), and so on... 2) option to have prior amount paid to same payee automatically fill. This will speed entering monthly amounts (I.e mortgage, auto payments) and a good alert if making an unintentional duplicate entry. I could not get my checkbook synced with my new iPad Pro and some way or another lost everything. Also setting up new checkbook in iPad Pro it isn’t working correctly. I don’t see any balance after I setup new acct and set my starting balance. I added payments and it shows the amount and null beside it but no balances will show. Really this app is just ok, nothing special. Reconciliation is weak. Love the new cleaner interface! Still wish they would make it so that expenses recorded for a future date do not subtract from your balance until that date. But, easy to use and quick to enter transactions. The newest version is forced on you so you have no way to refuse. When it goes to sync your data it loses any data you had since the app stopped syncing which apparently was March. I lost six months of register transactions, thanks!!!! I love having it conveniently on my iPhone, always with me. I love how it calculates my balance for me, without error! And I love how it remembers my recurring monthly payments and recurring deposits. (I saw where another reviewer said the recurring deposits don't work automatically like the expenses, but in fact it does! There's nothing dysfunctional about this app. I do wish, however, that it would be easier to click any item cleared or uncleared without having to open and edit each one. Makes balancing a much slower process, esp when I have so many! I also love how you can easily send a copy of the whole file to yourself or to your spouse or anyone else. I send a copy to my desktop to open in excel where I can easily resort by payee or by date or by category so that I can print year end reports for taxes. Saves me oodles of time, and a safe and quick way to backup data. Thank you Checkbook App makers!!! However I do wish the exports included the check#s, PLEASE!!! Best program ever. Wish you could import saved data in case something happens and you loose data in the program. Love it as it is. Amazing functionality!! Now I can have my information synced on my devices !!! Brilliant !! I’ve never had a glitch or incorrect info with this app. Input info right and it’ll give you correct results. Can you please incorporate a search feature for dollar amount, payee, notes, and date range? We should be able to search exact amounts just like we can search names. I have been using Checkbook for many many years and it is so easy to use. Makes keeping a register easier. Does just about everything one would need. Would like to be able to see a report on payees. Would like a back up. Had to reload my phone and try to do without it, couldn't. Love this app. The latest update installed August 16 reset my data to May. This is the second time an update has caused a major malfunction with the app. I am using the paid version of the app and have done so for a number of years but after this latest issue I have zero confidence in the author or the app. This has been my favorite bill paying app for some time except recently it keeps giving me an error code that it didn't before about inputting the category. It will not allow me to input transfers as normal. Please fix or I will have to discontinue using this app.